My daughter is a little bit obsessed with the tooth fairy. draws pictures, and asks the tooth fairy a bunch of questions. 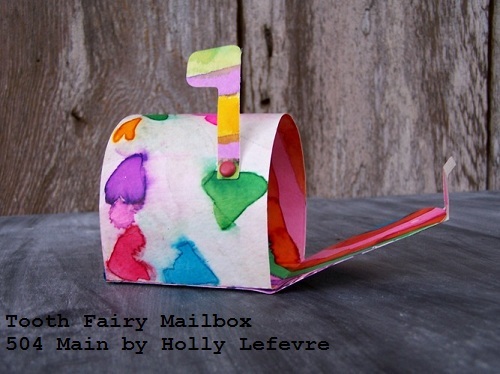 And since tooth fairies are teeny tiny and the tooth fairy's secret hiding place is becoming very full, anything Jules leaves for the tooth fairy has to fit in the mailbox! 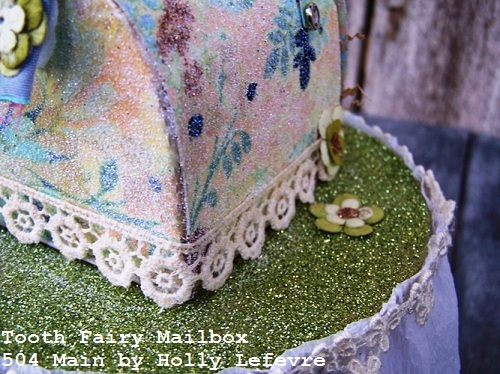 I used the Mailbox Die from Lifestyle Crafts as the base for this cute little mailbox. used is a wide range of manual die cutters. - get ready for Valentines day NOW! 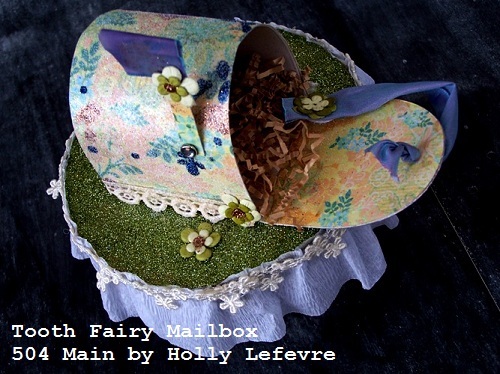 To make the tooth fairy mailbox, just use what you have on hand - you know each tooth fairy has their own style...ours likes glitters and flowers and ruffles. I did make one aother version using some artwork we had...I think it is pretty cute too! I pulled out my arsenal of girly things and got to work creating this magical sparkly mailbox (under the supervision of Jules of course!). I kind of want to make a boy mailbox now! 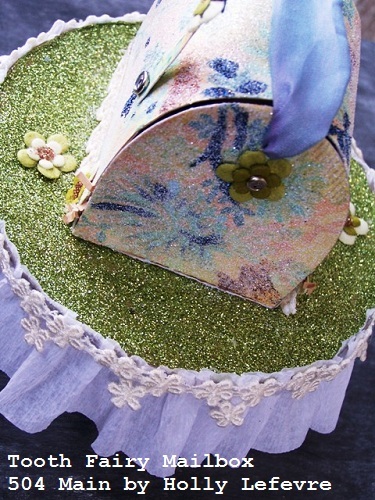 I used a variety of glues and adhesives for my project, you can get away with using less or other products. I just felt certain glues worked better for certain situations. NOTES: Be sure to protect your surfaces when using glue and spray adhesive! Cut circles out of chip board or cardboard. I cut 2 chip board circles but felt I needed more substance so I also added a cardboard backing for strength. 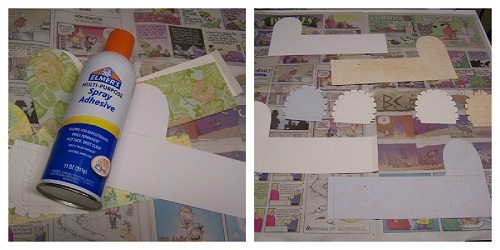 Glue them together using Mod Podge. I applied some lace trim because I wanted to and because it covered the hot glue line. 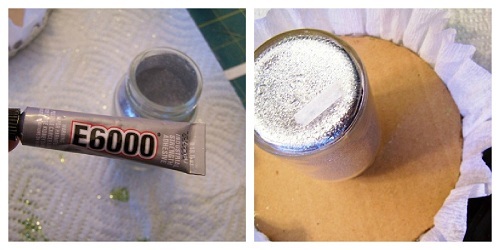 Apply E-6000 to the rim of the glass jar and center it on the back (un-glittered side) of the base. NOTE: THE INSIDE OF MY MAILBOX IS JUST WHITE, YOU CAN USE DOUBLE-SIDED PAPER IF YOU WANT A DESIGN INSIDE TOO. Cut the mailbox out using your die cutter. 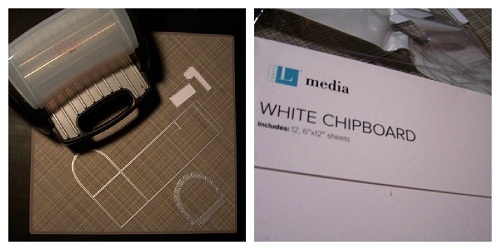 I cut one chipboard set and one set out of decorative paper. I wanted my mailbox to be durable. I also cut one mailbox door in a matching paper so that when the door was opened there was pretty paper. I then used spray adhesive to apply the paper to the mailbox. Assemble the main portion of the mailbox - fold along perforated lines and around the top over - with the chipboard I went slowly to round it so that it did not crease but rounded more smoothly. Fold back along perforated line and using a combination of hot glue and Mod Podge, insert into the back of the mailbox and let dry. I then Mod Podged the entire outside of the mailbox and let it dry. 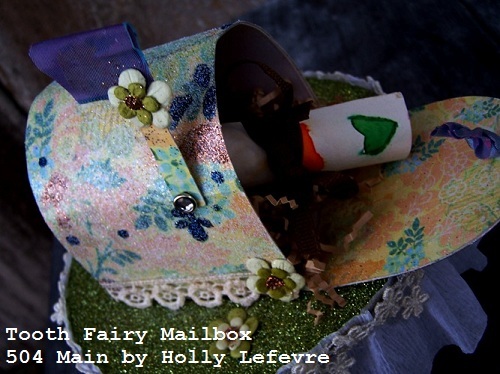 I felt like my mailbox was not sparkly enough ---I used a paintbrush, Mod Podge, and glitter and painted some areas of the printed paper and applied glitter to those areas. I still wanted more glitter so I sprayed the entire mailbox with spray adhesive and sprinkled white glitter all over...the print still shows through but now the entire mailbox sparkled. I punched a hole in the front of the mailbox and ran a ribbon in through the front, tying a knot on the inside of the mailbox door to hold the ribbon in place. 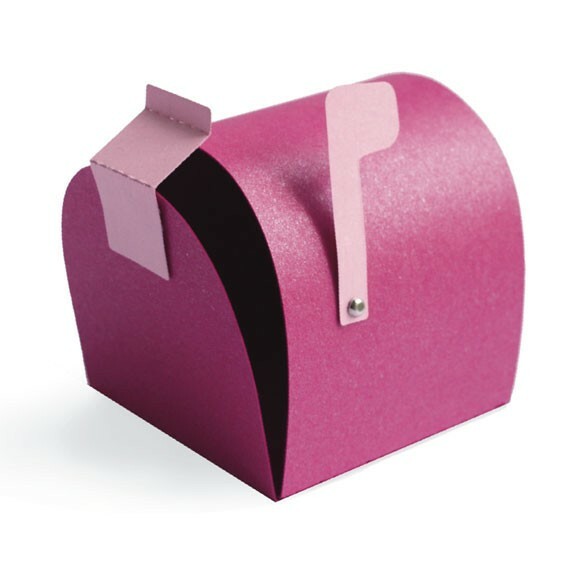 I ran the ribbon across the top of the mail box and on the back side applied a velcro circle (one side on the mailbox, one side on the ribbon) for easy opening and closing. I finished it off with the paper flower embellishments. For the flag, I wrapped a piece of ribbon over the top for a flag, added some of the Recollections flowers and fastened it to the mailbox, using the holes cut with the die, with a decorative brad. I used my hot glue (but you could use other glue) to glue the mailbox to the base - I centered the mailbox on the base. 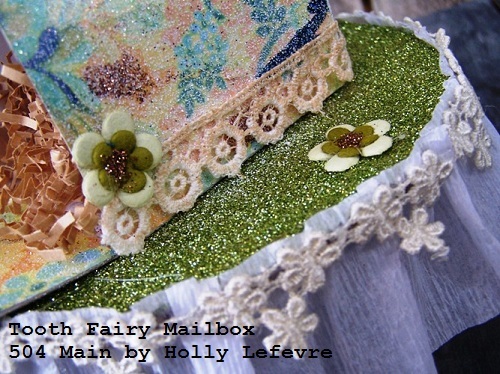 Then, using hot glue again (but you could use other glue) added a small piece of lace trim to the base of the mailbox. To finish it off, I glue a few of the paper flowers together and added some glitter in the center and placed them on the mailbox and base. Finally, I added some paper shreds (just because it looked cute) and my little girlie wrote the tooth fairy a note! USE the code 504main to get 20% off your order at Lifestyle Crafts! 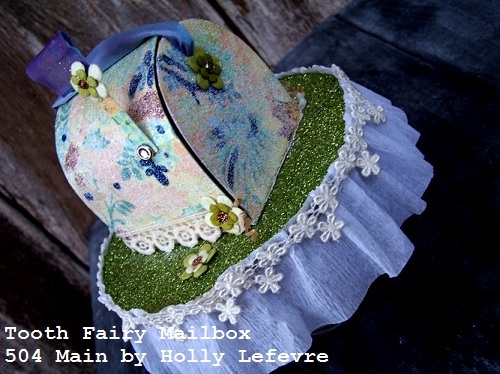 SO super cute and creative, Holly! 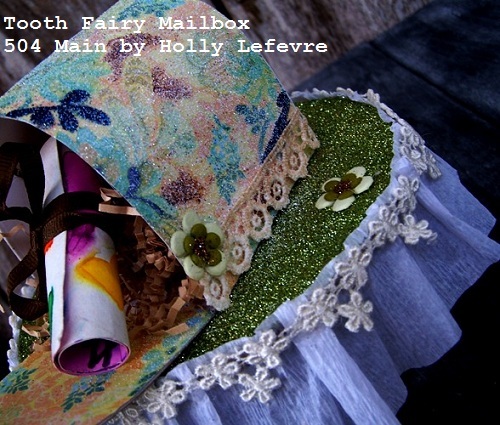 I love that the tooth fairy has her own mailbox! What a sweet and lovely project! Beautiful work. This is so cute! Might have to come up with a more "boy" version for my little guy - just has his first loose tooth! Pinned! to my blog today and your sweet comments. That is quite a creation Holly--excellent. That Tooth Fairy has been busy over here lately. I should suggest one be built for our house. Holly! This is so darn cute! I HAVE to do this! My very littlest hasn't lost any yet and my second littlest has only lost a few. What a wonderful and sweet idea! My littlest also asks a lot of questions about the tooth fairy - and even dressed up as the tooth fairy for Halloween! Great post! So cute ... I love all the glitter!